Beautiful and fragrant rose bushes in full bloom are one of the highlights of the warmer months. You have probably heard the expression “stop and smell the roses” many times before. While this phrase means to take a moment to appreciate the beauty around you, which roses certainly represent, actually smelling roses offers many health benefits. The use of roses for aromatherapy dates back many centuries. Some historians theorize that rose water and rose oil were first distilled in Persia around the 10th century. The cultivation of roses is thought to have occurred as early as 5,000 years ago in China. However, even before that, our ancestors could take a stroll through woodlands filled with rosebushes and reap their aromatic benefits. Aromatherapy is a time-honored tradition because of the connection between sense of smell and the limbic system of the brain, which controls emotion and long-memories, among other functions. 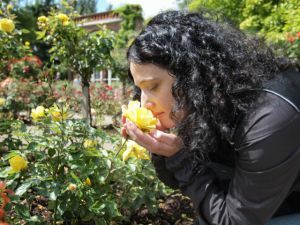 This is why a familiar scent can bring such a strong and vivid connection to a memory of a person, place or event, even if it occurred decades ago. The colloquial meaning of “stop and smell the roses” is not far from the aromatherapeutic properties of roses themselves. Smelling these sweet flowers has been linked to uplifting mood, soothing anxiety and depression symptoms, balancing hormones, lowering blood pressure, relieving headaches, slowing the rate of breath and generally creating a sense of happiness and harmony. The aroma of roses is also closely tied with aphrodisiac effects. It may also help to promote a more restful sleep and uplifting dreams when enjoyed before bedtime. One way to gain the aromatherapy benefits of roses, besides smelling the actual flowers themselves, is to add a drop of rose essential oil into a diffuser, or combine it with a base oil such as organic, extra virgin coconut oil and using it in a massage. Rose essential oil is usually steam distilled from Damascus roses, which are considered to be the most fragrant. When used topically, this oil can also contribute to youthful, healthy skin and fade scarring. It is sometimes diluted and taken internally, and offers antibacterial, antiviral and other properties, however, we highly recommend speaking to a natural health professional before going this route, and making sure the essential oil you have is pure and food grade if you do so. The issue with rose essential oil is that it can be very pricey, as it takes a great number of roses to produce just a little bit of oil. It is also often imitated by synthetic imposters, so unless you know your source, it is easy to be duped by a fake rose oil. If you don’t want to invest the money in purchasing a pure, certified rose oil, one solution is to make your own version, although it will not be as potent. To make a rose oil, start with a clean glass mason jar (boil in water to sterilize), and add one part fresh rose petals (making sure your roses are grown without pesticides or herbicides) to two parts organic grapeseed oil. Close the jar, leave it in a sunny spot for a few days until petals just begin to brown. Finally, strain the liquid and enjoy the aroma. Another way to enjoy roses is organic rose hip tea. This herbal tea is chock-full of vitamins A, C and E, the essential mineral zinc, and an array of antioxidants including flavonoids and tannins which work to reduce system-wide inflammation and boost the immune system. Prepare a steaming cup, slowly breathe the aroma while waiting for it to cool, then sip and savor. Or, you could celebrate the benefits of these beautiful flowers in the simplest, most natural way possible: lean over a fragrant, blooming rose, breathe deep and smile. Hey Buddy!, I found this information for you: "Stop and Smell the Roses…Literally". 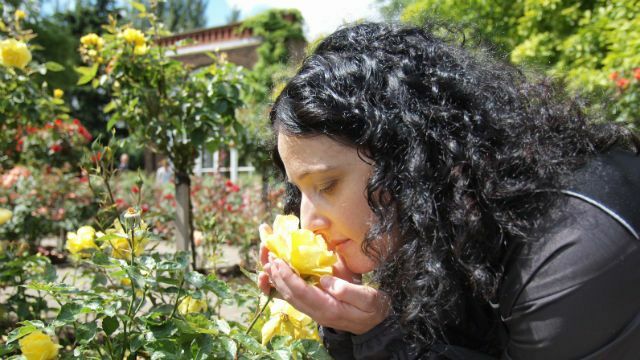 Here is the website link: https://www.thealternativedaily.com/stop-smell-roses-literally/. Thank you.